Heat oven to 350°F. In large bowl, mix all ingredients except cheese and Italian seasoning. Spoon into ungreased 8-inch square (2-quart) glass baking dish. Sprinkle with cheese and Italian seasoning. Bake 40 to 50 minutes or until thoroughly heated and bubbly. This recipe can be made the night before; just cover and store in the refrigerator until it's time to bake. It's a good idea to thaw the ravioli in the refrigerator overnight. 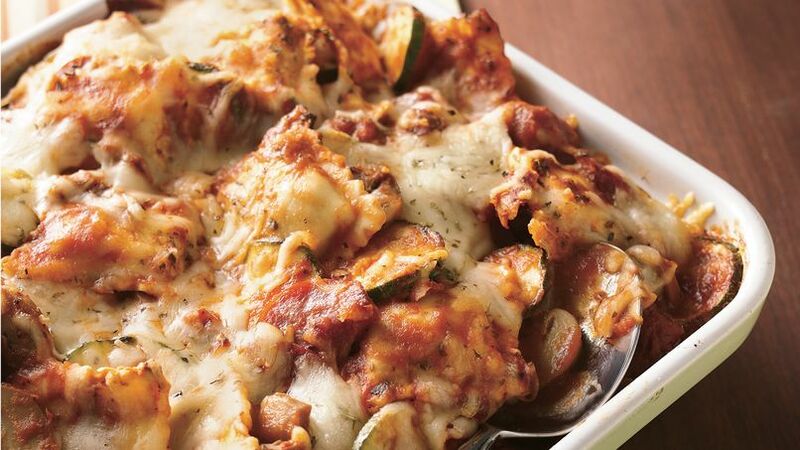 Turn frozen ravioli into an impressive casserole loaded with Italian flavorings and plenty of Swiss cheese.